Address: 7621 Pécs, Király u. 5. The hotel has 94 rooms. 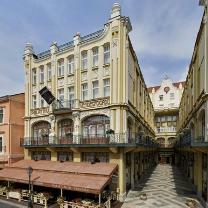 One of the most beautiful buildings of this exciting city Pécs, is the Hotel Palatinus in the historic city center. This beautiful Art Nouveau hotel is located next to the main square, next to shops and restaurants, making it a great base for exploring the city. Restaurant with international and Hungarian cuisine. Sightseeing: Cathedral, Old-Christian chapel, relics of the Turkish rule, Zsolnay Porcelain Museum, Vasarely Museum. Champagne-tasting in the cellars of Pecs, wine-tasting in Villany. Bathing in Harkany (20 km from Pecs). Room service, safe, luggage storage room, laundry, fax, photocopying, conference and banqueting facilities, non-smoking rooms. The hotel was built at the beginning of the century and was recently completely refurbished. The elegant banquet hall, where Bela Bartok once performed, was restored to its former splendor. This grand art-deco building offers all modern comforts and facilities. Sauna, solarium, massage, steam cabin. More information about Pecs and its other hotels!